Fiber optic communication systems are used to provide high-speed communication connections. the need for high-capacity fiber systems has dramatically increased as a result of key broadband data applications and a much lower cost of sending information through fiber. This figure shows the basic operation of a semiconductor light amplification stimulated emission of radiation (LASER) device. This example shows that a semiconductor LASER is constructed of a specific type of p-type and n-type semiconductor material. When a forward current is applied to the device, photons are produced within the optical cavity. As photons travel down the cavity, the produce other photons along their same path. This diagram shows that the optical cavity has a fully reflective mirror on one end that reflects all photons back into the cavity. At the other end, the mirror is partially reflective allowing some of the photons to exist from the LASER. This diagram shows that photons exit from the LASER in the same direction (coherent light). This figure shows how tight buffer tube stripping removes the tight buffer tube from optical fiber. This diagram shows that the tubing cutter contains a knife edge that is pressed onto the buffer tube of the optical cable. The tubing cutter is then rotated around the optical fiber several times to create a cut in the buffer tube without cutting the optical fiber strand. The tubing cutter is then gently pulled to apply pressure to the buffer tube resulting in the sliding of the buffer tube off of the optical fiber. This example also shows that the optical cable is looped and held (loop not to exceed bend radius) to prevent the buffer tube from pulling through the optical cable. 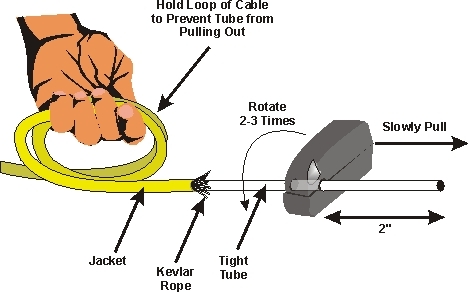 This diagram shows how a cable winch with a load monitor can be used to pull an optical cable through a conduit. This example shows that a winch is attached (clamped) to a pull box. Pulling rope has been already inserted through the conduit and the rope is wound around the pulling winch. 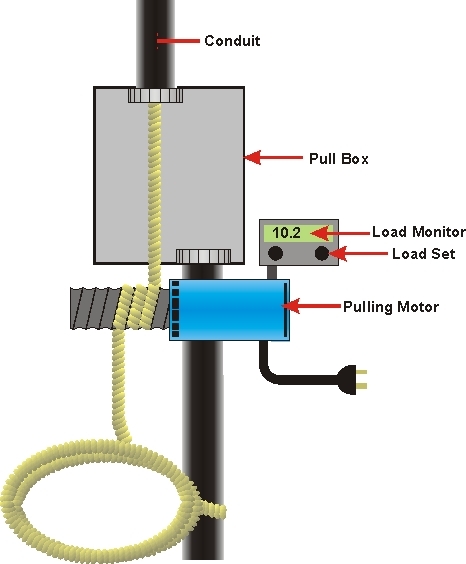 The load monitor is set for the maximum pulling load tension that is allowed for the cable. The winch operator will maintain tension (keeping the cable tight) on the pulling rope allowing the winch motor to pull the cable. If the cable tension exceeds the maximum setting on the winch, the motor may be automatically shut off or a clutch may be engaged lowering the maximum pulling force on the cable. 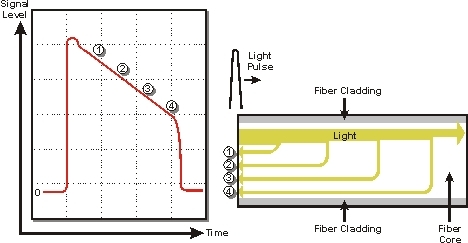 This figure shows the basic operation of an optical time domain reflectometer (OTDR). This diagram shows that an OTDR test instrument sends an optical pulse into an optical communication line (a fiber). As the light from the light burst travel down the optical transmission line, some of the light energy is reflected back due to scattering effects. The returned light signal level is shown on the OTDR display over time. The amount of time it takes between the forward traveling light signal (incident light) and the time the reflected light is received back at the OTDR determines the length of the optical signal has traveled in the optical transmission line. Mr. Mr. Lawrence Harte is the president of Althos, an expert information provider which researches, trains, and publishes on technology and business industries. He has over 29 years of technology analysis, development, implementation, and business management experience. Mr. Harte has worked for leading companies including Ericsson/General Electric, Audiovox/Toshiba and Westinghouse and has consulted for hundreds of other companies. Mr. Harte continually researches, analyzes, and tests new communication technologies, applications, and services. He has authored over 50 books on telecommunications technologies and business systems covering topics such as mobile telephone systems, data communications, voice over data networks, broadband, prepaid services, billing systems, sales, and Internet marketing. Mr. Harte holds many degrees and certificates including an Executive MBA from Wake Forest University (1995) and a BSET from the University of the State of New York (1990). Mr. Eckard is a design engineer with Alcatel. He has been with Alcatel since 1998 and has a decade's worth of experience in the networking and telecom field. He is an expert in passive optical networking protocols and was responsible for the development of both the BPON and GPON chipsets and the integration of these cores in communication processors for cost effective solutions. Prior to working on passive optical networks, Mr. Eckard designed other optical systems including SONET add-drop multiplexers and DS0/DS1 digital crossconnects. As a chip designer he has detailed knowledge of these different optical systems but has experience at solving system and network related problems. Mr. Eckard holds a BS in Computer Engineering, BS in Electrical Engineering and an MS in Computer Networking from North Carolina State University. This book starts with the optical principles including wave theory and particle theory. the optical spectrum is explained along with the fundamentals of lightwave propagation. you will learn the principles of reflection and refraction and how they are used in optical systems. Optical communication systems are composed of an optical transmitter, communication medium (fiber or air) and an optical receiver. an overview of the components and basic operation of synchronous optical network (sonet), synchronous digital hierarchy (sdh), fiber distributed data interface (fddi), passive optical networks (pon) and dense wave division multiplexing (dwdm) is provided. the common types of network equipment such as onu, adm, and optical switches are also described. Optical transmitters and their sources of light are explained. you will learned how light emitting diodes (leds) and lasers provide suitable light sources for optical communication and how modulators and multiplexers modify light signals so they can send information. The types of fiber optic cables and their characteristics are covered. you will learn how modal dispersion, material dispersion and cable bending affects the performance and ability of fiber cable to transfer light signals. the methods and devices used to couple light signals into and out of fiber cables are discussed along with the different types of optical connector types. Optical receivers and their photodetection processes are described. the different types of photodetectors and their ability (sensitivity) to light signals are explained. you will discover how demodulators and demultiplexers operate to convert light signals into multiple channels and back into their original form. Installation processes for installing optical equipment, cables and systems are described. you will learn the common methods of splicing fiber including mechanical and fusion (heat) methods. the tools and processes you need to install optical cable are described along with the methods used to pull and strip cables. you will learn about maximum pulling loads along with snort term and long term maximum bend ratios. in addition to installation, the key potential environmental hazards, chemicals that may be used, and some of the general safety precautions are discussed. Optical fiber testing including continuity testing and measuring optical loss. discover how to use an optical time domain reflectometer (otdr) to identify the specific locations of breaks or distortions in fiber cable. learn the basic steps for fiber optic link and system acceptance testing. troubleshooting processes and tips are included to help you diagnose and repair equipment and link failures along with how to maintain maintenance records.